Our conservatory design and installation team are specialists in a range of styles, including Lean-To Conservatories. Contact us to discuss your project with our fitting and design experts. 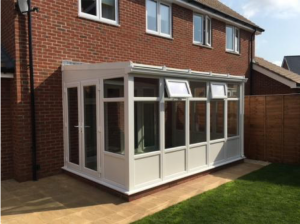 The Lean-to style conservatory complements all styles of architecture and can be customised with your choice of doors, windows and decorative finishes. The Lean-to style conservatory is a popular choice with customers wanting a simple design. Clean lines that complement every property style make it the perfect choice for a modern garden room with style flexibility. Every Lean-to style conservatory is individually designed and built using the finest materials. Select from uPVC or natural timber for durability – available in a wide range of colours and effects. We can also replace the roof on your existing lean-to conservatory.